Sunday May 6, 2018, 3:30 pm. 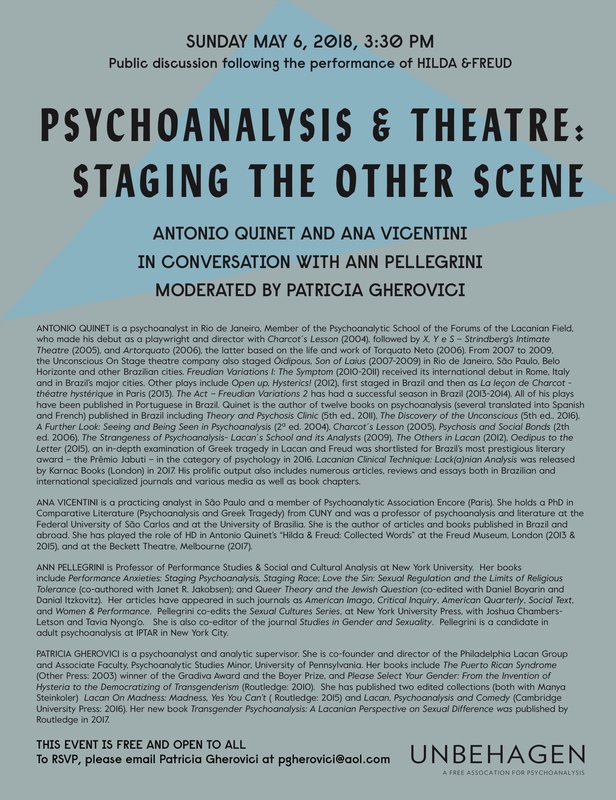 Antonio Quinet and Ana Vincentini in conversation with Ann Pellegrini. Public discussion following the performance of HILDA & FREUD on Sunday May 6, 2018. ANTONIO QUINET is a psychoanalyst in Rio de Janeiro who made his debut as a playwright and director with Charcot´s Lesson (2004), followed by X, Y e S – Strindberg’s Intimate Theatre (2005), and Artorquato (2006), the latter based on the life and work of Torquato Neto (2006). From 2007 to 2009, the Unconscious On Stage theatre company also staged Óidipous, Son of Laius (2007-2009) in Rio de Janeiro, São Paulo, Belo Horizonte and other Brazilian cities. Freudian Variations 1: The Symptom (2010-2011) received its international debut in Rome, Italy and in Brazil’s major cities. Other plays include Open up, Hysterics! (2012), first staged in Brazil and then as La leçon de Charcot – théatre hystérique in Paris (2013). The Act – Freudian Variations 2 has had a successful season in Brazil (2013-2014). All of his plays have been published in Portuguese in Brazil. Quinet is the author of twelve books on psychoanalysis (several translated into Spanish and French) published in Brazil including Theory and Psychosis Clinic (5th ed., 2011), The Discovery of the Unconscious (5th ed., 2016), A Further Look: Seeing and Being Seen in Psychoanalysis (2ª ed. 2004), Charcot´s Lesson (2005), Psychosis and Social Bonds (2th ed. 2006), The Strangeness of Psychoanalysis- Lacan´s School and its Analysts (2009), The Others in Lacan (2012), Oedipus to the Letter (2015), an in-depth examination of Greek tragedy in Lacan and Freud was shortlisted in 2016 for Brazil’s most prestigious literary award – the Prêmio Jabuti – in the category of psychology. Lacanian Clinical Technique: Lack(a)nian Analysis was released by Karnac Books (London) in 2017. His prolific output also includes numerous articles, reviews and essays both in Brazilian and international specialized journals and various media as well as book chapters. ANA VICENTINI is a practicing analyst in São Paulo and a member of Psychoanalytic Association Encore (Paris). She holds a PhD in Comparative Literature (Psychoanalysis and Greek Tragedy) from CUNY and was a professor of psychoanalysis and literature at the Federal University of São Carlos and at the University of Brasilia. She is the author of articles and books published in Brazil and abroad. She has played the role of HD in Antonio Quinet’s “Hilda & Freud: Collected Words” at the Freud Museum, London (2013 & 2015), and at the Beckett Theatre, Melbourne (2017). ANN PELLEGRINI is Professor of Performance Studies & Social and Cultural Analysis at New York University. Her books include Performance Anxieties: Staging Psychoanalysis, Staging Race; Love the Sin: Sexual Regulation and the Limits of Religious Tolerance (co-authored with Janet R. Jakobsen); and Queer Theory and the Jewish Question (co-edited with Daniel Boyarin and Danial Itzkovitz). Her articles have appeared in such journals as American Imago, Critical Inquiry, American Quarterly, Social Text, and Women & Performance. Pellegrini co-edits the Sexual Cultures Series, at New York University Press, with Joshua Chambers-Letson and Tavia Nyong’o. She is also co-editor of the journal Studies in Gender and Sexuality. Pellegrini is a candidate in adult psychoanalysis at IPTAR in New York City. PATRICIA GHEROVICI is a psychoanalyst and analytic supervisor. She is co-founder and director of the Philadelphia Lacan Group and Associate Faculty, Psychoanalytic Studies Minor, University of Pennsylvania. Her books include The Puerto Rican Syndrome (Other Press: 2003) winner of the Gradiva Award and the Boyer Prize, and Please Select Your Gender: From the Invention of Hysteria to the Democratizing of Transgenderism (Routledge: 2010). She has published two edited collections (both with Manya Steinkoler) Lacan On Madness: Madness, Yes You Can’t ( Routledge: 2015) and Lacan, Psychoanalysis and Comedy (Cambridge University Press: 2016). Her new book Transgender Psychoanalysis: A Lacanian Perspective on Sexual Difference was published by Routledge in 2017. This event is free and open to all. To register, please email Patricia Gherovici at pgherovici@aol.com.